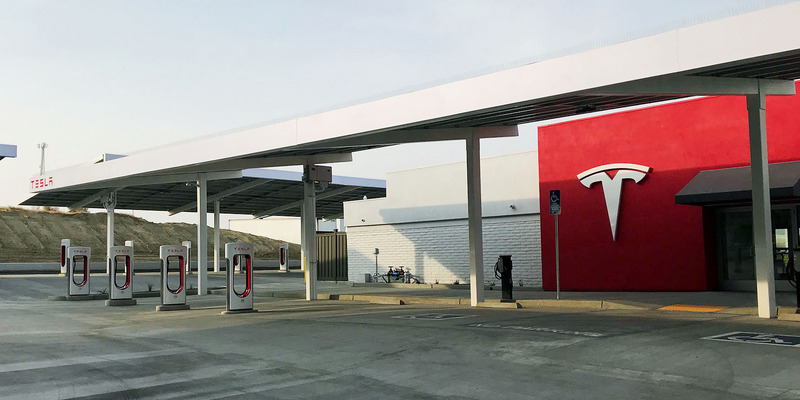 KETTLEMAN CITY, California Amid swaths of farmland and a smattering of gas stations, fast-food restaurants, and motels, Tesla's largest-ever Supercharger station sits tucked away from the main street that runs underneath the 5 Freeway, on a corner lot that used to be a Burger King drive-thru. On one of the two large flat-screen displays inside the lounge is a real-time world map with the locations of every Supercharger station on the planet. There are three numbers at the bottom of the screen kilowatt-hours delivered, miles enabled, and gallons of gasoline saved that tick up as you watch. This is now Tesla's domain. Its presence in an otherwise folksy enclave one of at least six on the route here from Los Angeles is a clear sign that Tesla is gearing up to own the electric-car future.Tesla says the Kettleman City Supercharger is its largest in the US. Another in Baker, California, sits along a major route connecting Los Angeles and Las Vegas.